When I first started programming the only type of code I wrote was procedural. You know the type, one thing leads to another with a thrown in function here and there and you have a working application. As I grew as a programmer, I began to find out that way of programming is fine for small projects but when I started to develop bigger applications my code became very disorganized and hard to read. To combat this I started writing my own classes to help me write better, reusable code that I could use in all my applications. Then I realized that although I was learning a lot by doing this, I was reinventing the wheel. Most of what I was writing had already been accomplished many times over in various PHP frameworks. 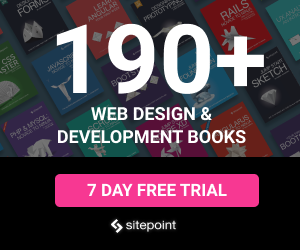 I began looking into the almost endless selection of PHP frameworks and saw most of them were also based on something called MVC. Learning to program using MVC was a complete paradigm shift for me, but it was well worth the struggle. If you want to develop applications with sell-structured, readable code that you can quickly diagnose problems in, then MVC is for you. In this article I’ll untangle the mysteries of MVC for you using CodeIgniter, a PHP framework based on the MVC pattern. I’ll first present a high level overview of MVC, what it is and how it can help you to become a better programmer, and then guide you through writing a simple web form the CodeIgniter way so you can see how the pattern looks in action. then you completely understand how a page full of mixed up PHP and HTML can become really hard to maintain and read. So let’s look at each part of MVC and see what each part represents. Model – encapsulates your data management routines. Usually this is the part of your code that retrieves, inserts, updates, and deletes data in you database (or whatever else you’re using for a data store). View – encapsulates the information that is presented to a user. This is the actual web page, RSS feed, or even a part of a page like a header of footer. Controller – coordinates the Model and View parts of your application to respond to the request. A controller accepts input from the user and instructs the model and a view to perform actions based on that input; it controls the flow of information in the application. To better understand how the MVC pattern works, let’s look at the steps you would take to code a PHP form using this pattern. The user interacts with the View which presents a web form. The user submits the form, and the Controller receives the POST request. It passes this data to the Model. The Model updates and queries the database and sends the result back to the Controller. The Controller passes the Model’s response to the View. The View updates itself with the new data and is displayed to the user. With so many MVC frameworks out there, how do you decide which one to choose – don’t they all provide similar functionality just differing slightly in their implementation and syntax? I had never used a framework before so I had to read through a lot of documentation and experiment with them to find out which one was right for me. I found that CodeIgniter had a much smaller learning curve then the others, which is probably why it has a reputation for being great for beginners. It’s documentation is very clear and provides many code examples to help you along the way. Although in this article I’ll be using CodeIgniter, the concept of MVC will be applicable to almost any framework you choose. CodeIgniter is a cinch to install and configure for you system. Follow these steps and you’ll be up and running in less then five minutes. Download the latest version of CodeIgniter. As of this writing, the latest version is 2.0.3. Uncompress the archive and place the uncompressed directory in your web root. Go to the CI directory on the server using your web browser. Again, in my case it’s http://localhost/CI. Now that you have everything installed you’ll have probably noticed all the directories that CodeIgniter has. Don’t be intimidated; you won’t have to deal with most of them since the majority of your work will take place in the system/application directory. Looking in the system/application directory there are subdirectories named controllers, models, and views. This is where you will place your files for your application. Your controller files will be in the controllers directory, model files in the models directory, and view files in the views directory. Now that you have a basic understanding of what the MVC architecture is and have CodeIgniter installed, let’s get down to some coding. 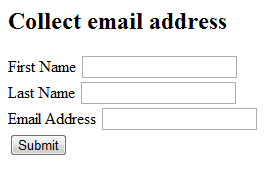 In this example you’ll create a very simple form to collect email addresses using CodeIgniter’s form helper classes and form validation library. Let’s get started. // form view otherwise present the success view. In the absence of a method in the URL, CodeIgniter will assume index. Hit submit without any input in the text fields to try out the validation. 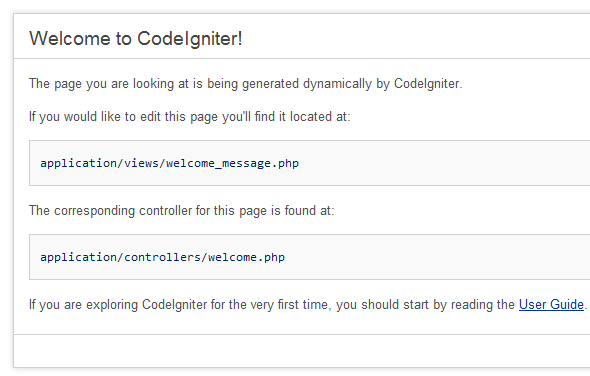 You’ll see CodeIgniter enforcing the rules you set up earlier in the controller and displays the error messages. With the database table in place, now you have to tell CodeIgniter where it is. Open up application/config/database.php and enter your database credentials. Specify appropriate values for the hostname, username, password, database, and dbdriver keys. The class has a method named insert_address() that is accepts the array of values passed in from the controller. CodeIgniter has a database class built in so you don’t have to write any SQL at all; $this->db->insert() will automatically generate and execute the SQL for you. The incoming data posted from the form is placed into an associative array to be passed into the model’s insert_address() method. Note the keys in the array have the same names as the columns in the addresses table. This is important for the final step in creating the model. Then the model is loaded with $this->load->model(), the data is passed to the insert_address() method, and the success view is displayed. Go back to http://localhost/CI/index.php/sitepointform and enter some data. If you fill in all the text fields correctly you’ll see the success page and the data is now in your database. Hopefully you now understand what MVC is all about, a way of separating pieces of your code based on their function to keep everything more organized. Though CodeIgniter happens to be my framework of choice, knowledge of the pattern is applicable to almost any other framework you choose, and of course you can implement it in your own code without a framework as well.